For the frequent flyer, airline credit cards are a rewarding companion. Find the best one for you and you’ll be rewarded with award flights, status upgrades, and special perks you won’t find anywhere else. If you tend to only fly one airline, apply for one of its branded cards. If you fly many airlines, choose a card that rewards you with points or miles you can redeem in a variety of ways. Bankrate has compiled the very best airline credit cards of 2019 from our partners here; choose yours and start flying better. Earn 2 miles for every dollar spent on eligible purchases made directly with Delta. Earn one mile for every eligible dollar spent on purchases. Commonly used for: Auto Rental Insurance, EMV, Extended Warranty Program, Free Checked Baggage, Mobile Pay Ready, Presale Tickets, Priority Boarding, Purchase Protection, Travel Accident Insurance, Travel Assistance, Unsecured credit card, Zero Fraud Liability. The simple rewards structure with this card means that you earn an unlimited 2x miles on every dollar you spend with Delta and 1x Delta SkyMiles for every dollar you spend with your Gold Delta SkyMiles card. Your miles will rack up quickly, especially given the card’s welcome offer. 2 miles per dollar at US restaurants. 2 Miles per dollar spent on purchases made directly with Delta. 1 mile on every eligible dollar spent on other purchases. Commonly used for: Auto Rental Insurance, EMV, Extended Warranty Program, Free Credit Score, Mobile Pay Ready, Presale Tickets, Purchase Protection, Unsecured credit card, Zero Fraud Liability. If you only fly a few times a year but you always fly with Delta then this card is worth considering. With no annual fee, a 10,000-mile welcome bonus and 2 Miles per dollar spent at U.S. restaurants and purchases made directly with Delta, you can stack up miles without hassle or expense. If you always travel with the same person - be it your wife or husband, sibling or best friend - the famous companion fare introductory offer that comes with this card will be incredibly valuable for you. It allows you to buy one ticket and get one for a low rate starting at $121 ($99 plus taxes and fees) after you make the first $2,000 in purchases within the first 90 days, and you also earn 40,000 bonus miles. Better still, you also get the companion fare annually on your account anniversary in the form of a discount code for a $99 base fare plus taxes and fees from $22, valid on all Alaska flights booked on alaskaair.com. 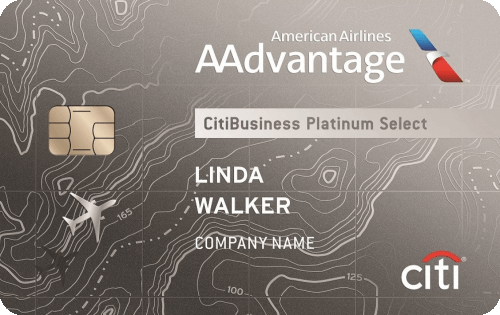 Business owners who enjoy flying with American Airlines will get a lot of value from this card. You'll get your first checked back free on domestic flights with American, preferred boarding, 25% savings on American Airlines inflight Wi-Fi and more. As an added bonus, you'll have the opportunity to earn an American Airlines Companion Certificate for domestic main cabin travel after you spend $30,000 or more on the card each year. Delta enthusiast? Fly often? The Gold Delta SkyMiles Credit Card from American Express will help you maximize your mileage at a minimum cost. Cardholders earn 2 miles for every $1 spent on purchases made directly with Delta and one mile for every eligible dollar you spend on other purchases. Even better, SkyMiles® members earn 7 miles per dollar spent on tickets. Cardholders can also take advantage of an easily attainable welcome offer: Earn 30,000 Bonus Miles after you use your new Card to make $1,000 in purchases within your first 3 months and a $50 Statement Credit after you make a Delta purchase with your new Card within your first 3 months. 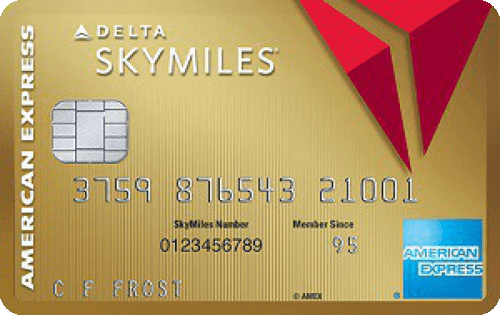 Read our full Gold Delta SkyMiles Credit Card from American Express review. Looking for an introductory airline card? 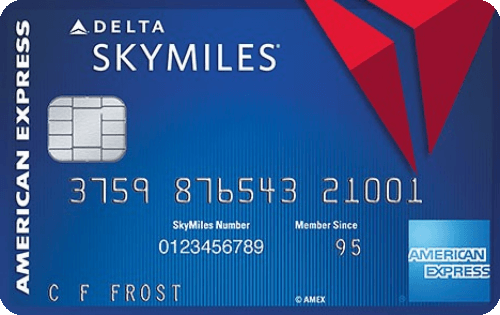 For Delta loyalists, the Blue Delta SkyMiles card is a great start. This card offers no annual fee and you’ll earn 10,000 bonus miles after spending $500 in purchases on your new Card in your first 3 months of Card Membership. Blue Delta SkyMiles cardholders receive a 20% savings in the form of a statement credit using the Card on eligible Delta in-flight purchases of food, beverages, and audio headsets. They also get American Express benefits like purchase protection, extended warranty, flexible payment options and more. Read our full Blue Delta SkyMiles® Credit Card from American Express review. Have friends, will travel. With the Alaska Airlines Visa Signature card, you’ll get unbeatable access to their airline transfer program and Famous Companion Fare™. Just spend $2,000 within the first 90 days of account opening and receive both 40,000 bonus miles and the Companion Fare offer from $121 ($99 fare plus taxes and fees from $22). 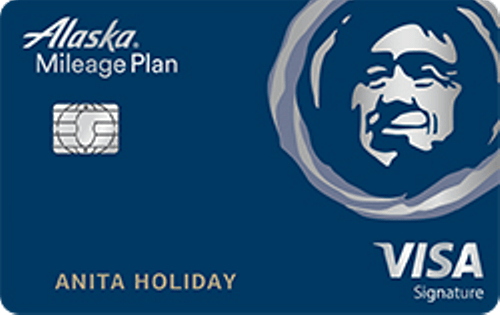 You’ll continue to get the Famous Companion Fare™ each year, which starts at $121 ($99 plus taxes and fees), valid on all Alaska flights booked on Alaskaair.com. Additional perks include a free checked bag for you and six guests, plus an earnings rate of 3 miles for every $1 spent on Alaska Airlines flights (1 mile per dollar spent on everything else). American Airlines loyalists will find a lot of value by adding this card to their wallet. With American Airlines perks, no foreign transaction fees and a great sign-up bonus, what’s not to love? For a limited time, earn 70,000 AAdvantage® miles after spending $4,000 in purchases within the first 4 months of account opening. You’ll earn 2x miles on eligible American Airlines purchases, at telecommunications merchants, cable and satellite providers, car rental merchants and gas stations; plus, earn 1x miles on all other purchases. The card also comes with standard travel protections like travel accident insurance, travel and emergency insurance and car rental insurance. Earn an American Airlines Companion Certificate for domestic main cabin travel after you spend $30,000 or more each year of cardmembership (fees apply). First checked bag free on domestic flights. It goes without saying but individuals who travel frequently for business or pleasure may benefit greatly from a travel card. Travelers can rack up frequent flier miles, discounts on car rentals and hotels, and receive other incentives when traveling, like lounge access or status benefits. These cards can also be a boon for those who travel overseas. Good travel rewards cards offer no foreign transaction fees, a perk that can keep you from racking up extra charges every time you swipe your card abroad. Foreign transaction fees are charges levied by the credit card issuer for transactions you make outside the U.S. and are usually around 3%. Airline and travel cards are typically offered to individuals with good to excellent credit. You may not qualify if your credit is subpar. If your credit standing isn’t great, you should work on improving your score first before applying for a travel rewards card. These cards offer the ability to earn miles for everyday purchases. Some even offer bonus miles and perks on hotel stays, saving you cash every time you’re away from home. That’s a plus. But many airline credit cards come with annual fees, and some are high enough that they can put a dent in the overall rewards you receive. This is especially true if you aren’t spending enough to earn bonuses or don’t pay off your balance each month, negating your rewards with interest payments. Make sure to pay your bill in full and on time. A travel rewards card can be a great way to save money and enjoy other benefits just for spending the way you normally would. Anyone who typically carries a balance will likely fare better with a low-interest credit card over a travel rewards card as the value of any rewards is far likely to be outweighed by the interest charges accrued on your debt. Decide if you want an airline-branded card or a card with transferable points/miles. Let’s say you live in a Delta hub city and travel weekly on business. In this scenario, you’ll likely benefit greatly from a premium Delta-branded card like the Platinum Delta SkyMiles® Credit Card from American Express. You’ll get a status boost and free checked bag when you fly, and enjoy a hefty intro bonus you won’t have trouble redeeming. If you don’t live in a hub city nor do you have a favorite airline, status upgrades probably aren’t as valuable, considering you’ll take advantage of them less often. Instead, you’d get better use out of a airline card with transferable miles, like the Capital One® Venture® Rewards Credit Card. You won’t get all the in-flight perks, but you’ll be able to redeem miles for flights on any airline. Consider how often you fly. If you’re flying quite frequently, you’ll be banking so many miles that you’ll have no problem overcoming an annual fee. If you fly only every once in a while, an annual fee may knock certain cards out of contention. Luckily, many airlines have several branded cards, each with varying annual fees and reward structures. Do the math on whether you’ll be able to make up for the annual fee before applying for an airline card. Consider how your new card will work with the other cards in your wallet. If you’ve already got a general rewards credit card that offers points on flights, will you really make use of another rewards card with transferable points? Perhaps you’d be better off getting a branded airline card that you’ll use strictly for purchasing flights and leaving the rewards card you already have for other purchases. It’s a balance of annual fees and maximizing the rewards you earn across your budget. What about benefits and perks? The best travel rewards cards will offer generous rewards rates and flexible redemption. There aren’t any blackout dates or restrictions on when and where you can use your points and miles. Top-shelf airline cards often include a ton of travel-centric extras like annual flight credits, insurances, lounge access, and bonuses or discounts. These cards are often designed for frequent travelers valuing luxuries (like upgrades and lounge access) and business travelers who clock a lot of miles every year. Make sure to check out how your points or miles are redeemed to ensure that they work best for your travel habits. Airline credit cards vs. flexible travel rewards cards: Are airline cards worth it? Also be sure to check out booking sites like Priceline and Expedia. As people are planning their travel for 2019, they are often running some pretty lucrative promotions when it might make sense to book through them instead of through another travel portal or directly with an airline or hotel.